Eoghan O'Gara blasting home a goal for Dublin in the Leinster SFC semi-final. 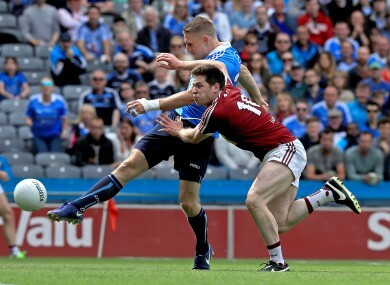 GAA PUNDIT COLM O’Rourke believes the football championship is in need of a drastic shake-up to address one-sided fixtures, following Dublin’s colossal win over Westmeath. The reigning All-Ireland champions inflicted a 31-point hammering on the challengers in the Leinster SFC semi-final — their highest championship score under Jim Gavin. It leaves Westmeath in a dermolaised state heading into the qualifiers, and O’Rourke insists that action must be taken to avoid these kind of results in the future. Speaking on the Sunday Game after the fixture at Croke Park, he made the argument for the introduction of another championship to accommodate lower-level teams. “What this shows again today is that the idea of a proper championship is a farce, whether in Leinster or in the rest of the country. “Teams like Westmeath and a lot of other teams — 23 or 24 others — are just not able to compete. The sooner we have different levels to suit the various teams, the better it would be. He added that Dublin cannot afford to show sympathy to Westmeath in situations like this. Several players including Con O’Callaghan and Niall Scully are all competing for places as Dublin seek to defend their provincial and All-Ireland crowns this year. “It was a sporting annihilation, an embarrassing thing for the Westmeath players. Dublin are ruthless because they need to be. The young players that they have put in here, like Con O’Callaghan and Niall Scully, they’re playing for their places. “Then Kevin McManamon and Bernard Brogan comes on. Imagine facing that when you’re getting tired? “They need to go well too, to keep themselves in the frame. The Dubs are playing against themselves and therefore, the level of performance from each individual is judged on day-to-day. “All they’re concentrating on, is an All-Ireland championship and we see from today’s performance that they’re fit, well, able, and the team ethic is running right through the team. Email “'The idea of a proper championship is a farce': Colm O'Rourke calls for championship shake-up”. Feedback on “'The idea of a proper championship is a farce': Colm O'Rourke calls for championship shake-up”.